What was that odd flotsam that appeared after the Gulf oil spill? Right after the Deepwater Horizon oil rig exploded April 20, 2010, marine scientist Monty Graham from the Dauphin Island Sea Lab in Alabama began exploring Gulf of Mexico waters to document the unfolding consequences of the unprecedented oil spill. “Following the blowout, we were going out on the water every other day or so,” he said, to collect water samples and make observations. On May 5, about 32 miles south of the Alabama coast, they observed something strange. But there was no trace of the wide oil slick on the ocean surface that was spreading out in all directions from the sunken Deepwater Horizon site. Some 50 relatively small pieces of the mysterious white flotsam, interspersed with sargassum weed, extended in an east-west line for 6 miles. Graham and colleagues collected samples, the largest about the size of a softball. 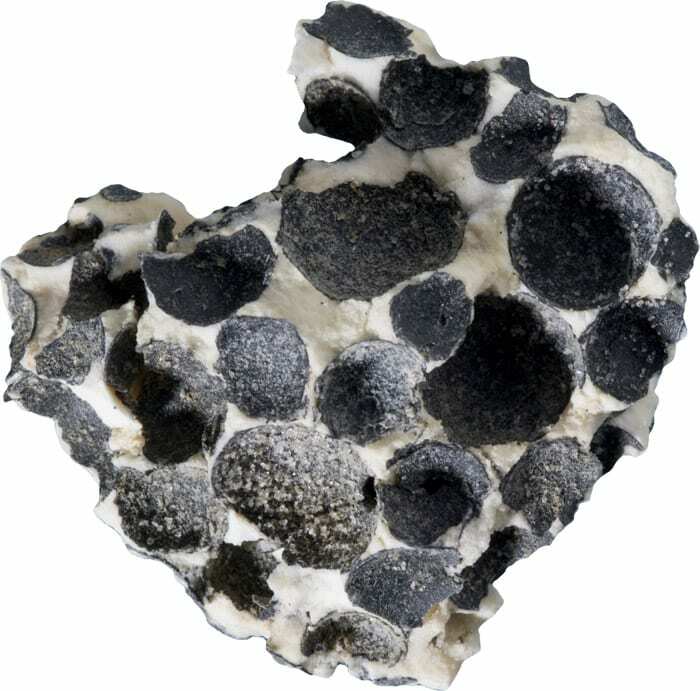 The material was hard but porous and uniformly embedded with black spheres less than a half-inch in diameter. Two days later, the researchers collected similar samples about 25 miles south of Dauphin Island. Nobody knew what the material was. Some speculated it came from Deepwater Horizon; others hypothesized that it could be coral or another substance made by marine plants or animals. Graham sent a few pieces of the material to Chris Reddy, a marine chemist at Woods Hole Oceanographic Institution (WHOI), where Reddy and colleagues determined that the material was a manmade, not natural, substance. The WHOI scientists then analyzed the oil on the debris using comprehensive two-dimensional gas chromatography, a technique that can identify the thousands of individual chemical compounds that comprise different oils from different reservoirs. 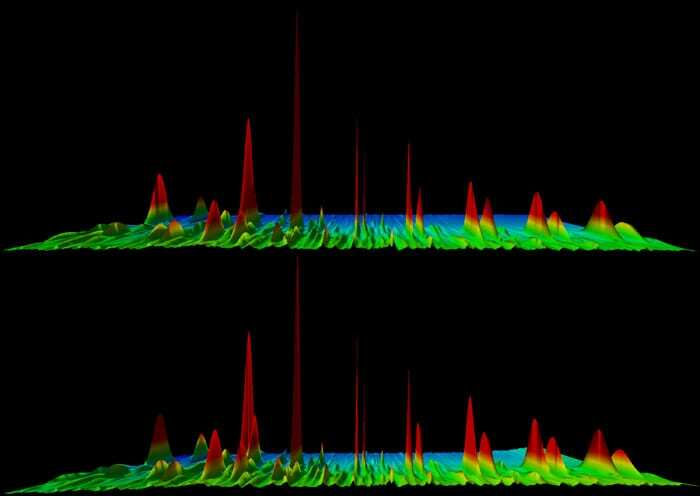 The chemical “fingerprint” of the oil on the debris matched that of oil from Deepwater Horizon. 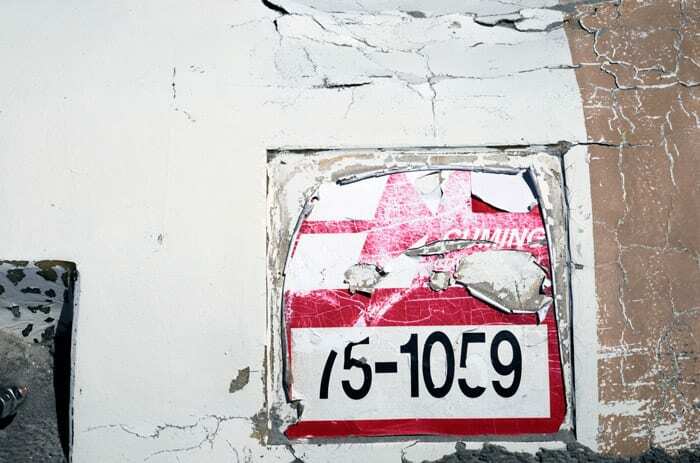 Still, the researchers did not know what the material was or where it came from. 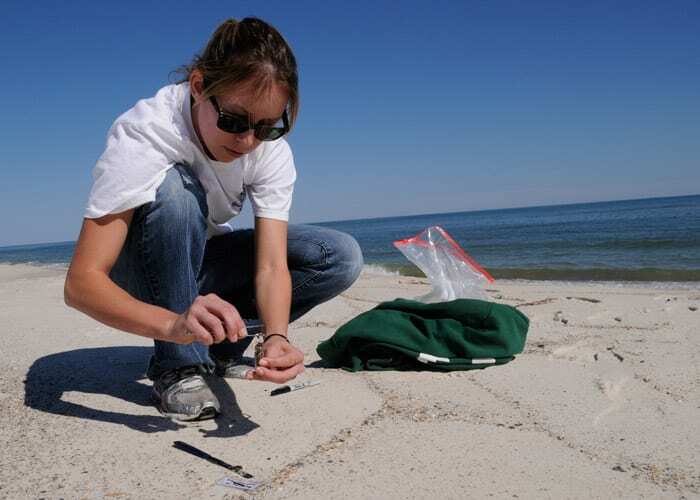 In April 2011, Reddy and WHOI researcher Catherine Carmichael visited the Dauphin Island Sea Lab, where Graham showed them other samples of the weird debris of various sizes that he had collected, including one he collected Jan. 19, 2011, on Elmer’s Beach, Grand Isle, La. These samples did not have any oil on them, heightening the mystery. A few days later, Reddy and Carmichael traveled to the Chandeleur Islands off Louisiana to look for samples of Deepwater Horizon oil that mixed with sand to create what they called sand patties on the beaches there. Partially buried in the sand were several large pieces of the honeycomb debris, ranging from 3 to 10 feet. “The cleanup teams and officials on the Chandeleur Islands told us that the material was from the Deepwater Horizon and that the Coast Guard had taken some of the larger pieces away,” Reddy said. The chemists turned gumshoes. 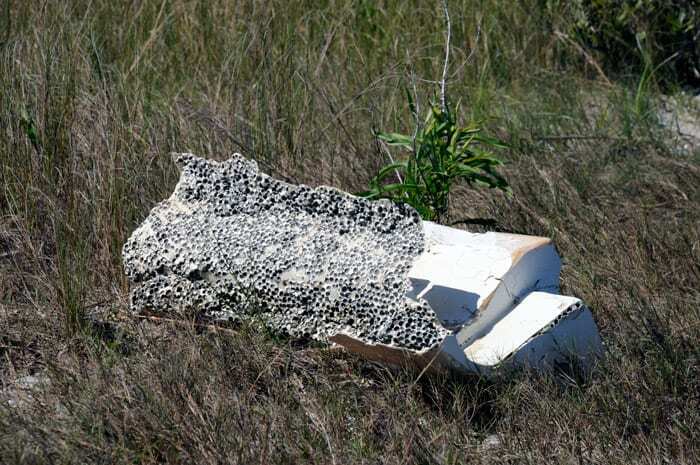 “I contacted the Coast Guard to hunt down somebody who could confirm that these big pieces of honeycomb came from the Deepwater Horizon, but I had no luck,” Reddy said. The evidence remained anecdotal. The clue became the smoking gun. Reddy found a company called Cuming Corporation in Avon, Mass., which manufactures syntactic foam flotation equipment for the oil and gas industry. Reddy e-mailed the company, and within hours, a Cuming engineer confirmed from the serial number that the debris came from material used to help maintain buoyancy for the pipe conveying oil from the Macondo well at the seafloor to the Deepwater Horizon oil rig on the surface of the Gulf. That sent the research into a new direction. 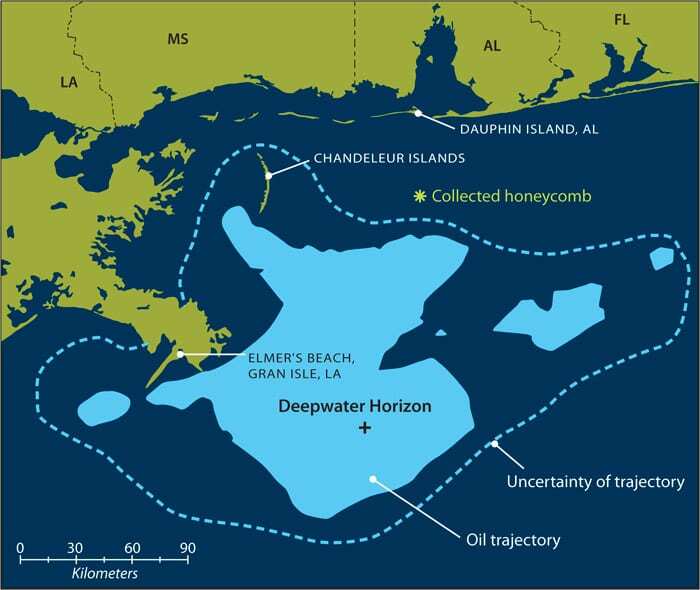 The scientists combined the locations of where Graham and colleagues found honeycomb debris on May 5 and 7 with daily forecasts produced by the National Oceanic and Atmospheric Administration (NOAA) of the trajectory of the spreading oil slick. NOAA used a model that incorporated currents and wind speeds, along with data from planes and satellites. On both days, the debris was about 6.2 miles ahead of the projected trajectory of the spreading slick. The explanation, the scientists said, is the principle of leeway, a measure of how fast wind or waves push materials. The leeway for fresh oil is 3 to 3.3 percent, but the scientists suspected that “the protruding profile of the buoyant material” acted like a sail, allowing wind to drive it faster than and ahead of the floating oil. In this case, the flotsam served as a harbinger for the oncoming slick, but because different materials can have different leeways, oil spill models may not accurately forecast where oiled debris will head. “Even a small deviation in leeway can, over time, result in significant differences in surface tracks because of typical wind fields,” the scientists wrote in a study published online Jan. 18, 2012, in Environmental Research Letters. The Coast Guard has a long history of calculating the leeway of various materials, from life jackets to bodies of various weights, to improve forecasts of where different objects would drift if a ship sank or a plane crashed into the sea. But calculating leeways has not been standard practice in oil spills. “We never had solid data to make the case until this study,” said Merv Fingas, who tracked oil spills for more than 38 years for Environment Canada, which is equivalent to the U.S. Environmental Protection Agency. 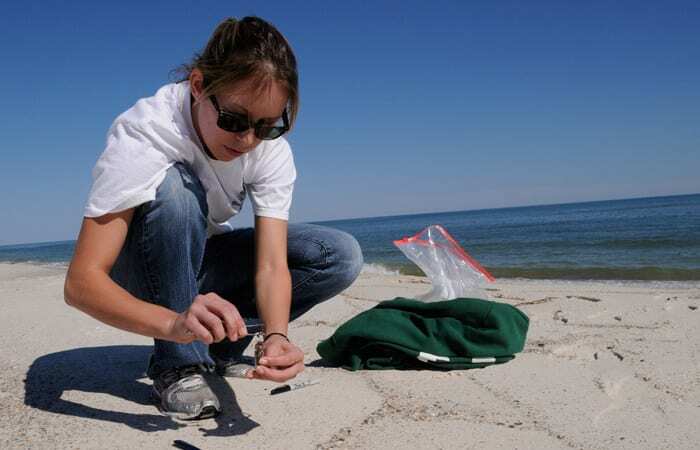 Along with Carmichael, Reddy, and Graham (now chair of The University of Southern Mississippi’s Department of Marine Science ), the research team included J. Samuel Arey from the Swiss Federal Institute of Technology, Laura Linn of the Dauphin Island Sea Lab, and Karin Lemkau and Robert Nelson from WHOI.